A couple of days ago, a knitter on a community board asked how to make pom-poms. Immediately, the little voices in my head led me to sit down and illustrate this subject. 1. (above) The traditional way to wind pom-poms: Cut two cardboard doughnuts of the same size. Sandwich a yarn (illustrated in red) in between the two layers. 2. 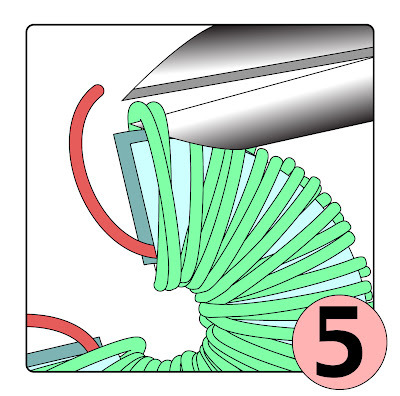 (above) Wind yarn (illustrated in green) over the doughnut, around and around, working the yarn through the center hole on each pass. 3. On illustration 2, you can see that the center hole is small. As you can imagine, it is something of a pain to wind the yarn through that center hole again and again. When I was 10, I had to make dozens of pom-poms for a project. 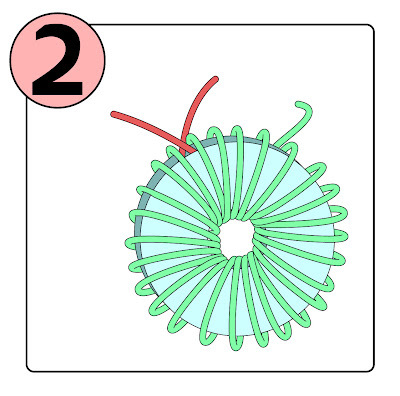 Being as lazy as the next 10-year old, I figured that, per illustration 3 (above), if one-quarter of the circle form is cut away, it is MUCH faster and easier to wind the yarn around the resulting three-quarter pom-pom form, and the pom-pom comes out just as well. 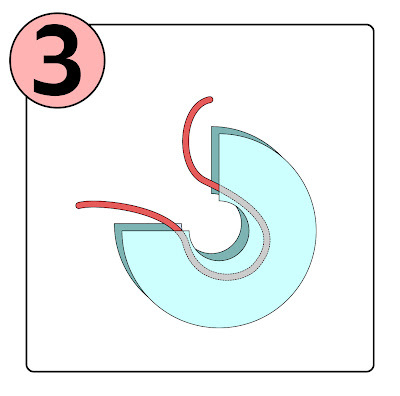 As shown, with a three-quarter form, as with the original full circle form, you begin by laying a yarn in between the two layers. 4. 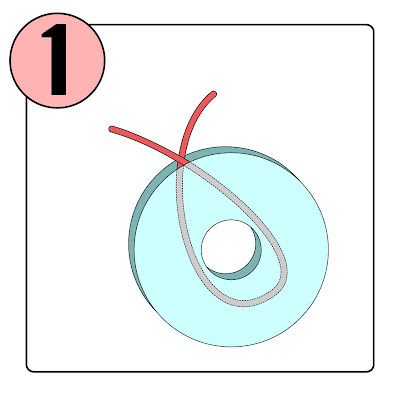 (above) As with the full circle form, wind the yarn around and around whole length of the three-quarter form, making sure that the center yarn does not get lost inside the form. The more yarn you wrap around the form, the bushier your pom-pom will be. 5. (above) Lay the form on a table and press it down firmly. Insert a scissors between the two layers of the form and cut the strands of pom-pom yarn where they pass over the outer edge of the form. 6. (above) Working carefully, pull up the center yarn tightly, then remove the form and lay it aside. 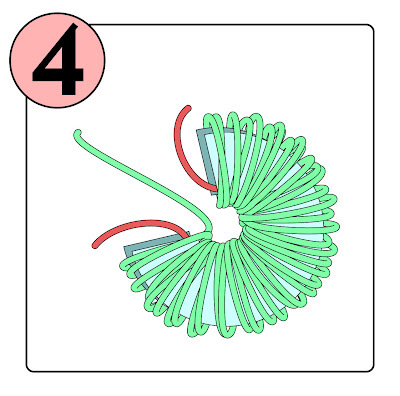 Tie the center yarn in a very tight knot--this knot is what holds your pom-pom together. Refinements are possible: for example, you can wind the center yarn several times around strands once they have been cut free, knotting with every re-wind, or knotting just once at the end. 7. (above) Fluff the finished pom-pom into a three-dimensional shape. Trim off any oddly long strands. Remember not to pull on any one strand, or it will pop loose of the pom-pom. The ends of the center yarn can be used to attach the pom-pom to the hat top (or whatever else you are decorating). In real life, of course, your center yarn would be the same color as the pom-pom, and it will therefore be invisible. a. Some yarns want to unravel when cut. In a very bushy pom-pom, this will not be a problem, because the yarn has not the room to unravel, but in a sparse pom-pom, you may face this issue. 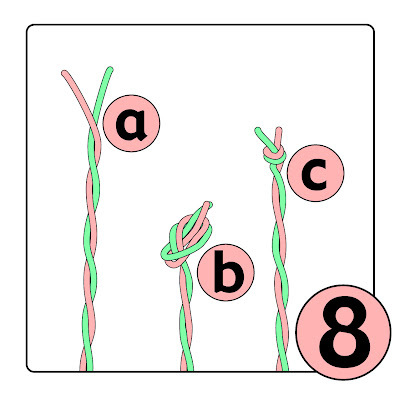 b.& c. You can solve this problem by tying a little overhand knot (granny knot) in the end of each strand of the pom-pom yarn. A sparse pom-pom of perhaps 10 or 30 strands with each strand topped with a knot is quite charming--the knots give the strand ends a little heft and they swing about charmingly when you move and look like a little fountain, or a spray of fireworks. One final note: You do not need to use a continuous strand of yarn to make a pom-pom. 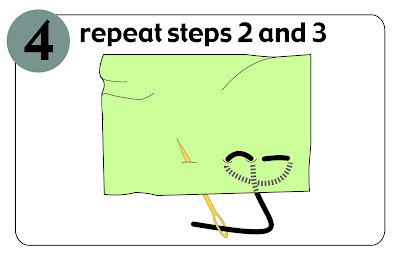 After all, you are going to cut the yarn into lots and lots of little pieces in step 5. You can wind little scraps of yarn over the form just as well as longer pieces--even if the scrap goes around the form only a couple of times, you can still use it--simply anchor it in place by overlapping its end with the next scrap. A pom-pom made of lots of scraps may shed odd bits where the center yarn did not catch the tail end of the scrap, but that is no particular problem--just comb out the pom pom AFTER you tie the knot, and these uncaught bits will fall right out. 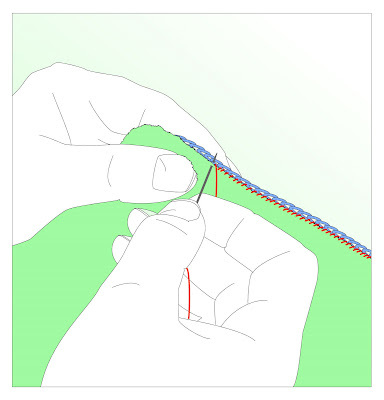 ATTACHING woven cloth firmly TO knitted fabric--sewing in a zipper, for example. Before machine sewing was invented, the back stitch was widely used for general seaming of all sorts (seaming=sewing cut pieces of cloth together). The back stitch was also widely used for hemming (hemming=sewing folded-over fabric shut so as to conceal a cut edge). 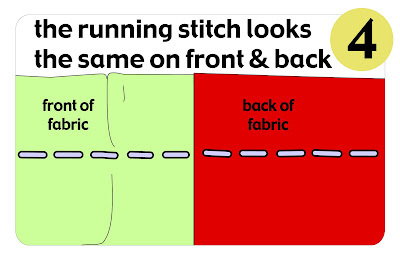 Today, most folks substitute machine-sewing for the long, straight lines of stitches at which back stitch excels. 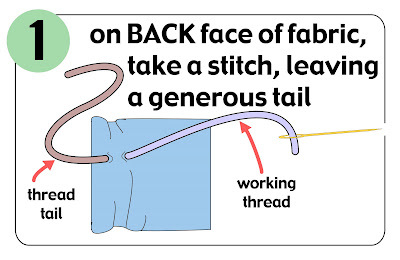 Yet, back stitch remains a very useful stitch to know--even if you have a machine and prefer it, you may find that setting up the machine, threading it, and maybe having to wind a bobbin, takes longer than sewing a simple seam by hand--sewing shut a narrow head-band lining of polar fleece, for example. For those without access to a machine, or those who prefer to work by hand, the back stitch would be an excellent choice for many types of sewing which hand knitters are likely to do: sewing up a purse lining or a sweater lining, or attaching a zipper. 1. (above) After you have anchored your thread on the back of the fabric, stab upwards with your needle, pulling it to the fabric face. Next, re-insert your needle one stitch length behind the point where it emerged. 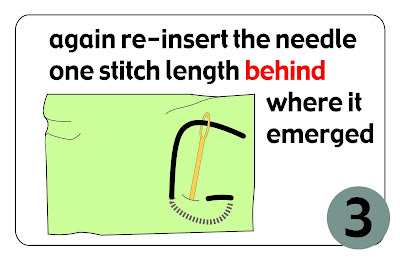 By "behind," I mean that right handed knitters, who are working from right to left, should insert the needle one stitch length to the right of where the needle first emerged, while left-handed sewers would reverse course, and insert the needle one stitch length to the left. 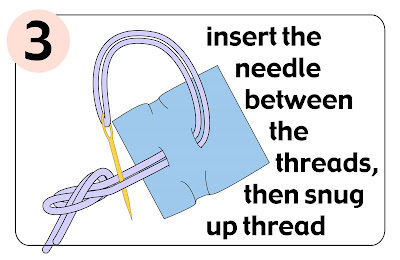 This step ends with the needle on the back of the fabric. 2a. 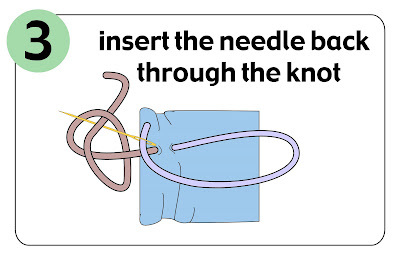 (above) At the end of step 1, above, the needle was drawn to the back of the fabric. 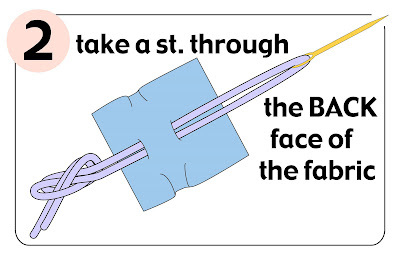 In this step, the needle will be returned to the fabric face by stabbing upwards, ahead of the previous stitch. 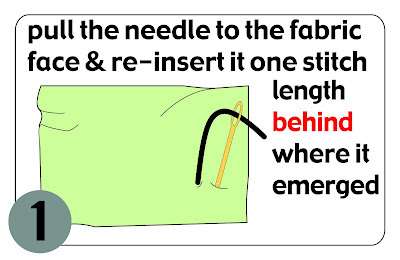 The distance between where the needle was stabbed down in step 1, and where it is to be stabbed up in step 2 is called a "stitch length PLUS." 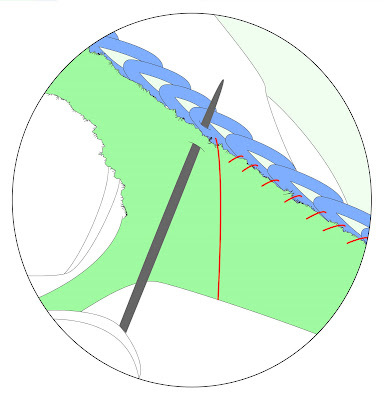 The "PLUS" refers to the fact that you must stab the needle upwards at a distance FROM the last stitch of one stitch length PLUS the "interruption length" between stitches. 2b. 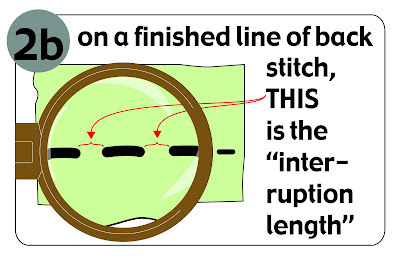 (above) The "interruption length" is simply a fancy name for the distance between the stitches. 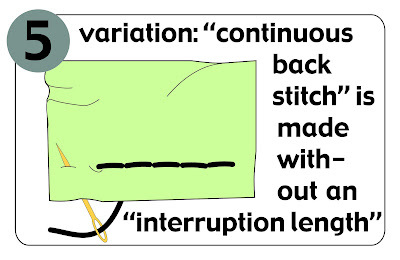 If you skip ahead to illustration 5, you can see a variation on the back stitch called the "continuous back stitch," in which the back stitch is created with no interruption length. With no interruption length, the stitches touch. 3. (above) To complete the second stitch, again re-insert the needle one stitch length behind where it emerged. 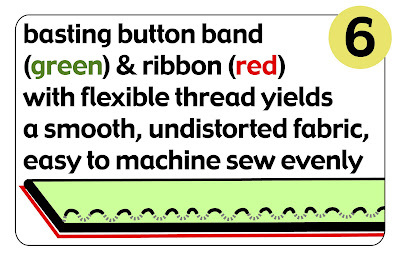 The path of the thread under the fabric is shown by the dotted line. 4. (above) Repeating steps 2 and 3 yields a line of back stitches. As you can see, the (dotted) line of the thread under the fabric is looped. This means that the back stitch takes quite a bit of thread--like an iceberg showing on the ocean's surface, the thread showing at the surface of the fabric is only a small fraction of the total amount. 5. 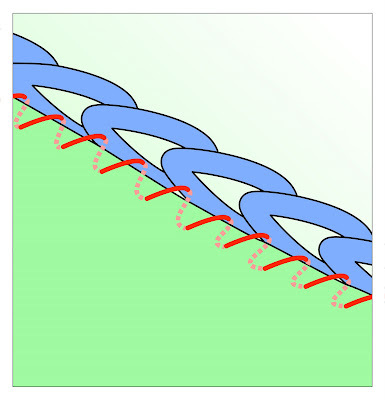 (above) The variation called the "continuous back stitch" is illustrated here. 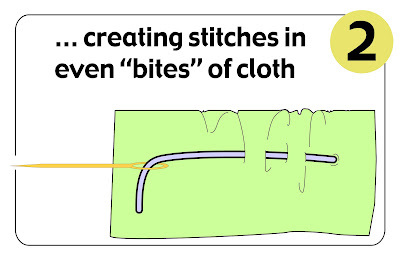 To make the chain of stitches continuous on the face of the fabric, the "interruption length" has been diminished to zero. 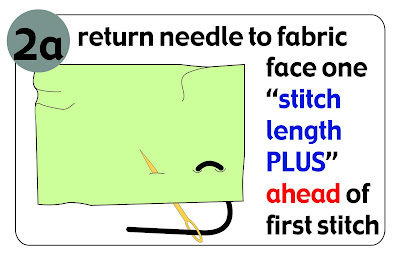 In other words, a continuous line of stitches on the fabric face has been made by stabbing the needle up EXACTLY one stitch length AHEAD of the previous stitch (as illustrated) then stabbing it down IN THE SAME HOLE as the previous stitch came up. 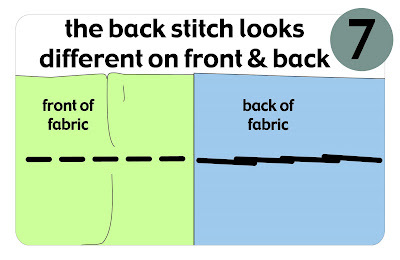 There is no particular structural difference between the regular back stitch (WITH an interruption length) and the continuous back stitch (NO interruption length) but the look is different, and some folks prefer one look over another. 6. 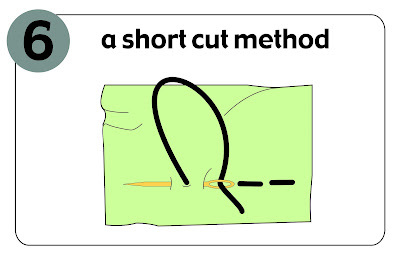 (above) As with the running stitch illustrated in the last post, the back stitch can also be created by a shortcut method. 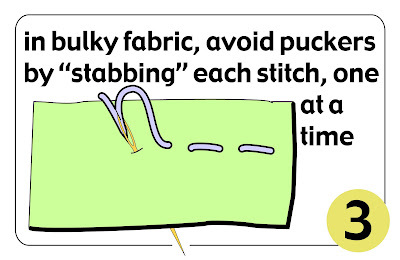 However, this shortcut method is best reserved for thin fabrics--bulky fabrics would pucker by this method, so bulky fabrics are best sewn by the stabbing method illustrated in steps 1-4. 7. (above) Unlike the running stitch, the back stitch does not look the same on both sides. The back of the fabric shows the loops where the thread was "brought back" before the stitch re-emerges on the fabric face. 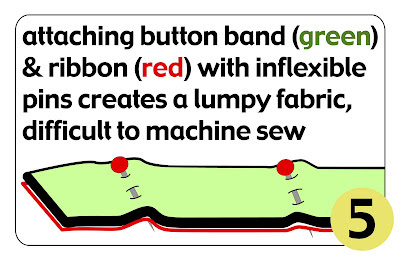 This loop of thread attending each stitch is one reason why the back stitch is superior to the running stitch: those thread loops form a little reserve of thread which can adjust (somewhat, at least) when the fabric is stressed. 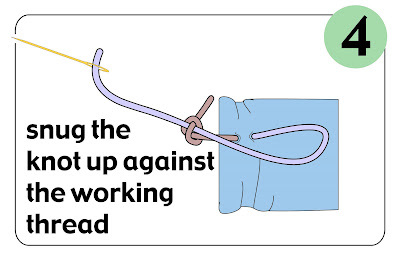 Also, the loops distribute the stress on any one stitch over a greater area of fabric, which helps prevent wear holes where the thread emerges from the fabric, and helps protect the thread from snapping when stressed. Regardless of how important the concept of thread reserve is to hand sewers, hand knitters should BEWARE not to be misled. To hand knitters--accustomed to the great stretch of knitted fabrics--the scale of the stretch allowed by the thread reserve of the back stitch is negligible. It is only in the context of the relative inflexibility of woven cloth that the thread reserve in back stitch is worth talking about. For use on stretchy fabric like hand knits, the back stitch should only be used where a firm attachment is wanted between a piece of woven cloth and the knit fabric--inserting a zipper or a grosgrain ribbon backing on a button band. Yesterday's post (starting a single thread in fabric--first knot) was incomplete, as I realized after it went live. 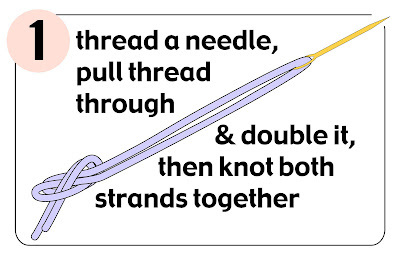 Here is the missing part--starting off with a DOUBLED thread--first knot. Before TECHknitting turns to the subject of fully lining hats with Polar fleece, there will be an intermission. After publishing the previous post (lining hats, headband style, with Polar fleece) various communications have revealed that there is a certain hesitance among knitters (you know who you are!) to get involved in projects which require hand sewing. Yet, I know from a previous TECHknitting poll, that there ARE lots of handknitters who would like to learn to line knitwear. 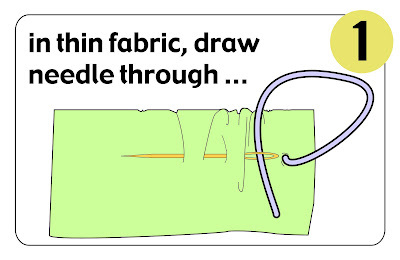 Bottom line: for the next several posts, TECHknitting will focus on BASIC HAND SEWING stitches and techniques useful to hand knitters. Today, we'll start at the very beginning: how to start your thread. 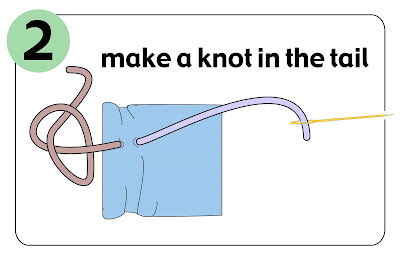 The other posts in this series will include the running stitch, the back stitch, the overcast (whip) stitch and how to end your sewing (how to make the final knot). Once these techniques are illustrated, further posts about lining knitting will make more sense, I think.